I’m proclaiming today to be reader appreciation day on Running on Real Food, so excuse me while I gush over how much I love you guys. I can’t tell you how much I enjoy all your comments on the blog, interactions on social media and emails that you send me. It means so much to me. 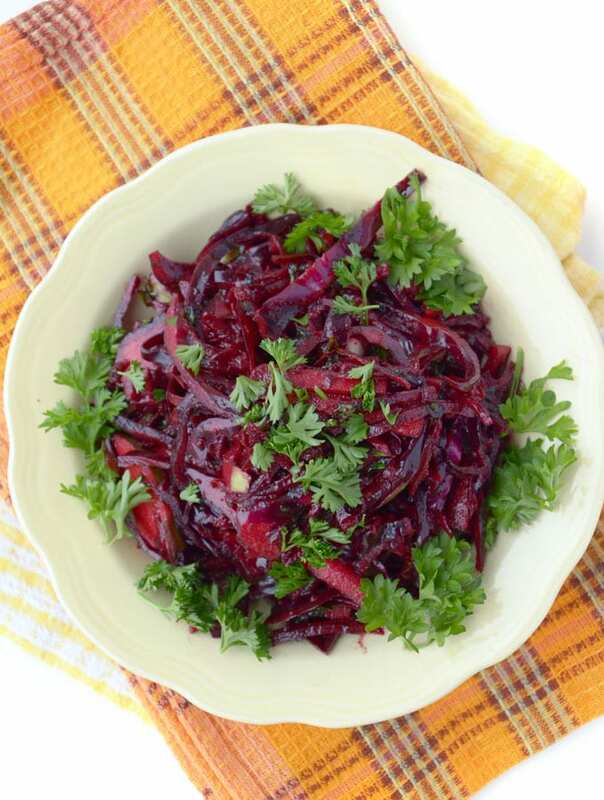 In honour of my love for you, I present this beautiful, Raw Beet and Apple Slaw. It’s pink and good for your heart, so it kinda represents love, doesn’t it?! I started Running on Real Food so I could connect with people trying to live their healthiest, happiest life, people just like me! I wanted to share my experiences in healthy living as well as start a positive and supportive conversation around nutrition, fitness and wellness. You guys have provided me with just that. So, thank you so, so much! Keep those comments and emails coming. Every single one of them makes my day and encourages me to keep the blog going, as much work as it is sometimes. I really do love it though, mostly because you’re all here with me. My little heart loves you so very much. As I head in to the third year of Running on Real Food, let’s keep this relationship going, shall we? 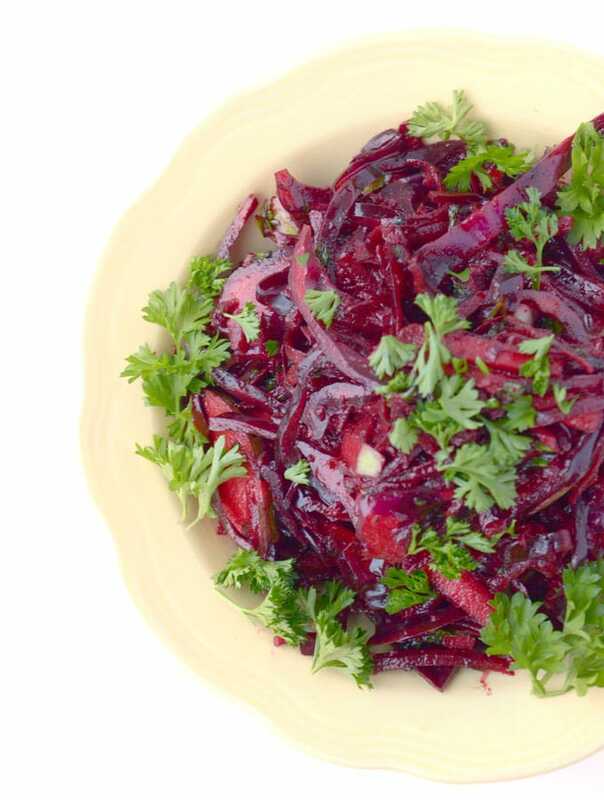 Speaking of my little heart, this beet and apple slaw makes my heart just about as happy as can be. It’s so fresh, so nutritious and as delicious as it looks. 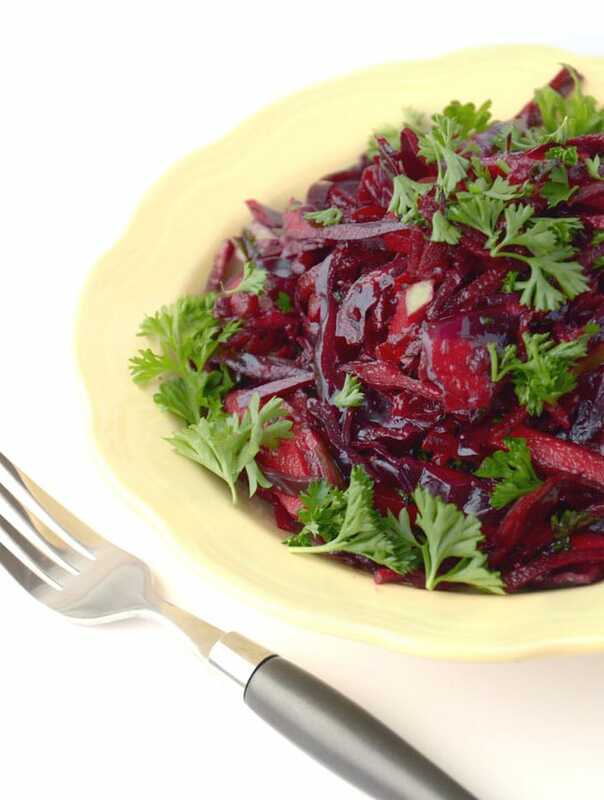 As much as I love me so balsamic maple roasted beets, I rarely cook beets in my kitchen hence the addition of raw beets to this gorgeous slaw. Grate, eat. That’s it! I add them to salads all the time, partly for their prettiness factor but also for their health benefits. 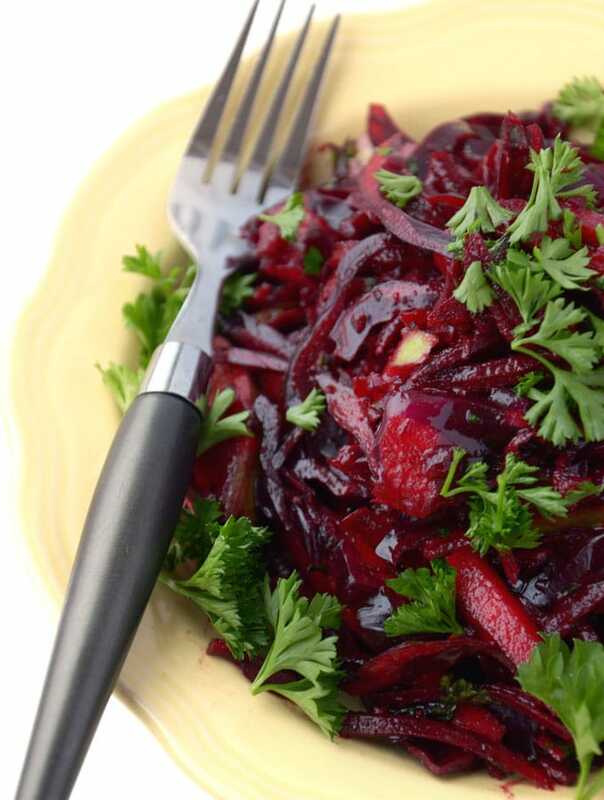 Beautiful beets contains vitamins and minerals such as potassium, magnesium, fibre, phosphorus, iron, vitamin B, A, C, folic acid and beta-carotene. They’re great for detoxifying the liver, contain feel-good tryptophan and betaine, can lower blood pressure and even improve inflammation. And don’t forget those beet greens, they’re packed with nutrients too! That part I usually do cook. Try sautéing them in a little bit of olive oil, a lot of garlic and a spritz of lemon. Let’s get to it! Enjoy and again, thank you so much for reading, commenting, Tweeting..however it is you connect with me, thank you, thank you, thank you. Add everything to a bowl and mix well. Mmmm! Well you know the way to my heart! A fantastic, refreshing and appealing recipe that looks like it packs the flavor. Not being a vegan or vegetarian I really love the inspirational and delicious recipes that provide some great inspiration for the few days in my week that I take a break from meat.